Ok, first a confession: I am addicted to chocolate. Not your average Hershey chocolate bar. No thank you. I crave deep, dark, rich chocolate. I adore homemade chocolate chip cookies. Brownies make me cry for joy. What I do not generally care for, however, is chocolate cake -- generally too airy and dry and lacking in the intense chocolate I crave so much. 'Tis not the case with flourless varieties, however, which is why the chocolate cake section of my recipe journal lacks more than a tablespoon or two of flour. Dense chocolate cakes make me happy. Warm gooey chocolate cakes bring me to my knees. So, when I read over Nigella Lawson's recipe for the flourless variety she calls "Chocolate Cloud Cake" I was immediately smitten. Last Friday evening we had friends over for a casual dinner. Finally, an excuse to try this recipe! I'm not certain if they too have an out-of-control chocolate addiction, but I do know that no one uttered a word until their respective dessert plate was clean. Sips of wine, yes, but no words. Preheat the oven to 350 degrees F. Line the bottom of a 9" spring-form cake pan with baking parchment. Melt the chocolate in a double boiler, add the butter and let melt in the warm chocolate. Beat the 2 whole eggs and 4 egg yolks with 1/3 cup of the sugar, then gently add the chocolate mixture, the orange-flavored liqueur and the orange zest. In another bowl, whisk the 4 egg whites until foamy, then gradually add the remaining sugar and whisk until the whites hold their shape but are not too stiff. 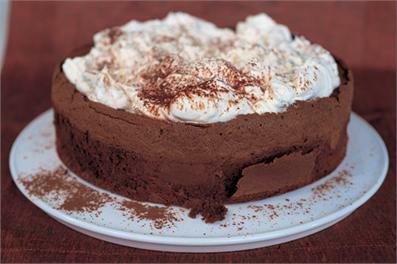 Lighten the chocolate mixture with a dollop of egg whites, and then fold in the rest of the whites. Pour into the prepared pan and bake for 35 to 40 minutes or until the cake is risen and cracked and the center is no long wobbly. Cool the cake in its pan on a wire rack; the middle will sink as it cools. When you are ready to eat, place the still pan-bound cake on a cake stand or plate for serving and carefully remove the sides of the pan from the cake. Don't worry about cracks or rough edges, it's the crater look we're going for here. Whip the cream until it's soft and then add the vanilla and orange-flavored liqueur and continue whisking until the cream is firm but not stiff. Fill the crater of the cake with the whipped cream, easing it out gently towards the edges of the cake, and dust the top lightly with cocoa powder pushed through a tea-strainer. Oh, the memories! This sounds amazing. I'm so glad your guests knew enough to zip it. Poor Allison! It is fairly amazing! Unfortunately Kevin left town the next day so the amount I consumed on my own was also fairly amazing! ; ) Miss sharing warm chocolate cake with you!